I'm forever on the quest to find the holy grail of deodorants. Mitchum is pretty darn good but trying new products is important and when I came across Sebamed I was intrigued. The product claims to protect the natural barrier function of the skin's acid mantle as the product has a pH value of 5.5 which is the value of healthy skin. I don't 100% understand that but from what I can gauge that means the skin is pH balanced. Sebamed's Roll-on is a fairly natural product as it has no artificial colours, harmful chemicals, alcohols or metal derivatives which are often added to deodorants. 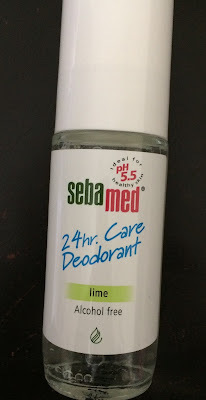 In fact, this deodorant is pretty darn natural - as it works by halting the production of odour causing bacteria but without impeding the actual function of the sweat glands. I think that this is important as I like to use gentle products on my skin, especially when it comes to deodorant as your armpits can become really dry and rough if you use harsh products. I like sticking to the natural stuff for this reason. I went for the Lime Roll-on as lime is a subtle but pleasant scent. I've been wearing this deodorant for a few days now during the day and, bearing in mind that it's been absolutely roasting, it's done really well. I've not smelt any body odour on myself during this time - I even asked my boyfriend (and he's brutally honest!). I have been sweating, but it just hasn't had the body odour smell at all and I've been working long days in this heat! I'm actually really impressed as I think that this product matches the claims that it makes: the sweat glands were working but there was no odour whatsoever. I'd really recommend giving this deodorant a go as it's working well for me so far.